While antique furniture provides a beautiful look back into the past, years of wear and tear can take its toll on a particular piece. 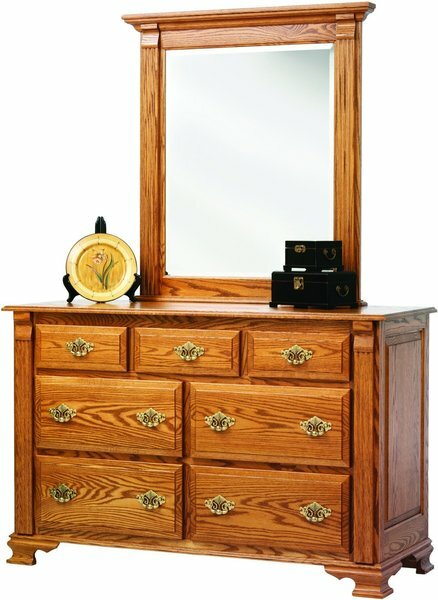 Crafted with an authentic, Early American style, using many of the same techniques of the period, our Amish Made Journey's End Colonial Dresser will give you the perfect, classic look, with the modern luxuries of a brand new case piece. With the raised panel sides and subtle foot and side detail, this simple Chippendale design will make the perfect statement piece for any room! Bench-built by a quaint, family owned Amish woodshop, in the heart of Ohio, each dresser is crafted using the finest North American hardwoods and finished with an heirloom luster that will give you the perfect hand-me-down that your family will enjoy for generations. Offering seven full-extension drawers, that glide smoothly on the side-mounted slides, you'll have all the room you need for your clothes, linens and delicate items. Add our undermounted slides for classic floating drawer look that provides a soft close mechanism to ensure a smooth close, every time. The optional matching mirror will complete the look and give you a way to make sure you look your very best for the day ahead. Please call one of our Amish Furniture Specialist today with any questions you have on our Journey's End Dresser. Request your stain samples today, so you can be sure you're getting just the right piece to incorporate into your favorite space.